Nearly nine years after the "Doctor Who: The Movie", and almost sixteen years after the last episode of the television series was aired, The Doctor finally returned to our screens, with a new face, a new companion, a new TARDIS console room, and an all-new backstory... if a bit of a confusing one. Unlike with all previous new Doctors, the audience did not have the chance to see this new Doctor’s regeneration at first, simply starting out with him already fairly comfortable with his new body (Although the fact that he looked at a mirror and commented on his ears in "Rose" suggests that it happened only shortly before he appeared for the first time). While we have learned that the Eighth Doctor initially regenerated into the ‘War Doctor’ incarnation during the devastating Time War between the Time Lords and the Daleks before he regenerated into this incarnation ("Night of The Doctor"), since the later Doctors officially considered the War Doctor to not be ‘The Doctor’ due to the actions taken by that body when he triggered the galaxy-destroying Moment to destroy Gallifrey and the Daleks, this incarnation is thus The Doctor’s official ninth incarnation despite being the Doctor’s tenth body overall. While the Tenth Doctor and Eleventh Doctors were later able to redeem the War Doctor by helping him save Gallifrey by sending it to an unknown pocket universe ("The Day of The Doctor"), the War Doctor’s memories of their plan were erased as he departed and regenerated, resulting in him being left convinced that he had destroyed Gallifrey as he had originally intended. While we are unaware what happened to him immediately after his regeneration, the end result is the same; the Ninth Doctor, tracking his old foes the Nestene Consciousness shortly after his regeneration, arrived on Earth in London, 2005, and, while tracking the Nestene signal, met shop assistant Rose Tyler as he checked out a department store where Nestene energy had been detected ("Rose"). With Rose's help, The Doctor was able to track the main Nestene Consciousness to its base under the London Eye, where Rose was able to take it out with a sample of antiplastic The Doctor had prepared earlier while The Doctor fought with an Auton. Having defeated the Consciousness, The Doctor offered Rose the chance to travel with him, but Rose initially rejected the offer, prompting The Doctor to depart on his own, concluding that he was still too new to this incarnation to have a companion. However, after a brief trip with new potential companion Ali - which nearly went wrong due to Ali’s nature as a Karkinian causing her to approach threats in a more violent manner than The Doctor might prefer ("The Beast of Babylon") - The Doctor returned to Rose based on Ali’s suggestion, informing her that the TARDIS travelled in time as well as space. Her interest inspired once more, Rose thus joined the Ninth Doctor for the trip of a lifetime with this newest of Doctors. From the beginning, it was obvious that this Doctor was, in many obvious ways, far more human than the others, even if his means of expressing it made it clear that he was still very alien. Throughout the series, even in minor, subtle ways, it was apparent that he cared a great deal for his companion Rose Tyler, holding hands with her on several occasions and actually being jealous of her still-close friendship with her ex-boyfriend Mickey Smith - who he commonly referred to as 'Ricky' to avoid admitting that he didn't remember his name -, occasionally referring to Mickey as ‘the Idiot’. Throughout his life, however, despite his normally light-hearted appearance, he had a melancholy and lonely personality, which he mainly concealed with the habit his past selves had of making jokes in the face of danger, only letting his 'guard' down when he was alone. His loneliness could be attributed to his guilt at being the last survivor of the Time War, all other Time Lords having lost their lives in the conflict, leaving him to deal with the guilt and knowledge that he had survived the destruction of his entire race. In many ways, however, he combined some of the best qualities of his previous selves; the frivolity and emotional availability of the Eighth Doctor, the ingenuity of the Third Doctor, the apparent vulnerability of the Fifth Doctor, the keen sense of humour of the Second Doctor (As well as the early Seventh Doctor), the depth of feeling of the Sixth Doctor, the (occasional) irascibility of the First Doctor, and the quirkiness and refusal to be mistaken for a human of the Fourth Doctor. On some occasions he also demonstrated a certain enthusiasm for his travels, showing great excitement when he met Charles Dickens ("The Unquiet Dead"), and occasionally philosophically musing about various minor matters, such as when he commenting that humanity spent so much time wondering about how they would die that they never considered the possibility that they might survive ("The End of the World") or when he reflected that a flower Rose had found on her first trip to an alien world could be the local equivalent of a daisy or the rarest flower in the universe ("The Monsters Inside"). He also displayed his past selves' dislike of violence, although like many of them, he wasn't afraid to use it if he had to, taking up a gun in "Dalek", breaking a window with a robot’s head to escape an underwater tunnel - although this can be excused due to the sonic screwdriver having been stolen - ("The Clockwise Man"), and knocking out a guard in "Bad Wolf/The Parting of the Ways". However, his temper was far more apparent than in past lives; unlike the Fourth Doctor, who once said 'It may be irrational of me, but human beings are quite my favourite species', the Ninth Doctor often referred to humans as 'stupid apes', and showed less patience with them than he used to, sometimes seeming unimpressed by their mental and observational qualities, yet at the same time wanting to protect them and other species. Ironically, despite his disdain for humans’ intellectual abilities, this Doctor occasionally appeared less intelligent than other incarnations, requiring others to save him by coming up with their own plans where other Doctors could have come up with escape strategies on their own or never fallen into those traps in the first place, such as The Gelth tricking him into helping them spread over London ("The Unquiet Dead"). He also fell victim to minor deceptions such as his jacket being stolen while he was attending a dinner ("The Clockwise Man"), and needed help identifying The Slitheen's planet of origin by having his companions go over the facts available about them so that he could narrow down the options ("Aliens of London/World War Three"). He also regularly displayed a certain lack of the ‘on-the-spot’ initiative that had often characterised some of his previous selves, such as when he locked himself and his companions in the conference room of 10 Downing Street to escape The Slitheen without considering how he would defeat the invasion trapped inside the conference room ("Aliens of London/World War Three") or gave himself the ‘alias’ of ‘Doctor Table’ to rescue a Neanderthal from a hospital rather than come up with something more original ("Only Human"). Despite this, he still had a significant amount of raw intelligence, quickly determining how to reverse teleportation systems to prevent his enemies escaping ("The End of the World" and "Boom Town"), giving Rose instructions that allowed her to pose as an astrophysicist using code phrases that only they would understand ("The Monsters Inside"), refining a gene that would allow humans in the vicinity to temporarily breathe fire using a rogue geneticist’s equipment ("Only Human") and putting together a Delta Wave emitter in under an hour despite his initial claim that it would take three weeks (Although this may have been referring to the time he would need to refine it to only target his enemies rather than a setting that would kill everything). This Doctor is also noteworthy as, for the first time since the UNIT era, The Doctor actually had regular contacts on his visits to Earth, rather than just meeting up with someone already involved in the crisis and enlisting their aid in sorting it out. Like the Third Doctor, the Ninth commonly contacted the first people he had met in this incarnation (As far as we know, at least); in this case, Rose's mother, Jackie Tyler, and Rose's ex-boyfriend Mickey. Despite his apparent dislike of the two of them, reflected on such occasions as The Doctor being unwilling to even thank Mickey after his assistance proved vital in saving innocent lives while battling the Quervils in "Winner Takes All", it was evident that he appreciated them in his own way; he respected Jackie's concerns about her daughter travelling with him, and entrusted Mickey with a virus that would wipe all information relating to The Doctor from the internet, although Mickey never apparently used it. This version of The Doctor also possessed a wider variety of gadgets than before. While other Doctors were content with merely using the sonic screwdriver to get out of awkward situations (Baring the brief period when it was destroyed, for obvious reasons), the Ninth Doctor, while using a modified sonic screwdriver with far more functions than his old versions, was also known to use psychic paper, with which he could show anyone looking at it whatever he wanted them to see, thus providing himself with ready-made 'official documentation' whenever he needed it. On their second adventure, The Doctor modified Rose's mobile phone so that she could call home from wherever - or even whenever - she was (As well as the more basic advantage of allowing her to call home even if normal phones couldn't receive a signal in her current location, such as when they were trapped in the Downing Street cabinet room). The Doctor’s darker side was eventually demonstrated in "Dalek", when The Doctor and Rose arrived in the alien collection of billionaire Henry Van Statten and The Doctor was asked to look at Van Statten's only live specimen - a Dalek (Specifically, what The Doctor believed to be the last Dalek in the universe). In the confrontation with it, The Doctor showed a side of himself that had never been seen before; the side that not only truly hated the Dalek, but actually took delight in its pain and frustration, as well as its helplessness due to a damaged gun, The Doctor confidently proclaiming his role in the destruction of the Dalek fleet before becoming more melancholy when the Dalek’s questions forced him to recognise his status as the last of his kind. The Doctor was initially angry at the Dalek claiming that the two were the same - both the last of their kind - but then claimed that it had a point, as he knew what it deserved. The Doctor then showed his vicious side in the confrontation with the Dalek, sending massive electric shocks through it and dismissing its plea to have pity where past Doctors would take the Daleks’ lack of mercy as a reason to show it. As the Dalek broke out of its cell and began to advance out of the underground base, The Doctor ordered it to die after establishing a video communication with it, to which the Dalek replied that 'You [The Doctor] would make a good Dalek'. When Rose was cornered by the Dalek, The Doctor took up an alien gun to stop it, but, in the confrontation between him and the Dalek, it took Rose to point out that the Dalek had changed... and The Doctor realised that, if he continued what he was doing, he too would have changed into what he'd always fought. This Doctor’s greater hostility was further explored during confrontations with his own companions. During a trip to Satellite Five in the year 200,000, new companion Adam Mitchell attempted to transfer information from the future back into his own time after having a chip planted in his head, nearly resulting in a being called the Jagrafess gaining access to the TARDIS, until another resident of the space station where they'd landed managed to shut the Jagrafess down ("The Long Game"). Despite the fact that no harm had been done, outraged at Adam’s violation of his trust, The Doctor took him home and kicked him off the TARDIS in a fit of rage, condemning him to a lifetime of non-importance as merely going inside meant he ran the risk of the implant being discovered and his head cut open by curious scientists. In the very next story, he then almost left Rose behind when she changed history to prevent her father dying, apparently only staying because the TARDIS had lost its link to its interior dimensions due to the destabilisation of reality, leaving The Doctor to battle the time-beasts known as the Reapers while they fed on the 'scar tissue' of the tear in time caused by Rose's actions. Despite his hostility towards Rose, his time in the past also gave The Doctor a chance to show his kinder side; when trapped in a church and talking to a young couple about to get married, he told them that even though he’d travelled to places and done things they couldn’t imagine, he’d never had an ordinary life like them... and, on some level, it was obvious that he wished he could have had that chance, if the universe was only a kinder, safer place. His continued compassion for humanity was reflected during a later adventure in London in World War Two ("The Empty Child/The Doctor Dances"), where The Doctor not only gained a new companion in the form of ex-Time Agent Captain Jack Harkness but simultaneously saved the entire city from an infection by renegade nanogenes that Jack had unintentionally released on the city. Reprogramming the genes by discovering ‘Patient Zero’ - a young boy who had been unintentionally ‘infected’ with the genes and improperly repaired due to their lack of knowledge of human anatomy - The Doctor not only demonstrated his joy at the knowledge that he had managed to save everyone who had been altered by the nanogenes, but also displayed his continued fondness for humanity, praising the dedication of Doctor Constantine, who had continued to care for his nanogene-infected patients even when he had lost his entire family and had no idea what was wrong with the victims, and expressing great glee at being able to reunite a mother with her child by curing him of the ‘infection’, his optimism and general enthusiasm given a significant boost. The Doctor and Rose then departed, after picking up Jack as their new companion from his soon-to-self-destruct spaceship. Shortly after this, The Doctor was transported back to Satellite Five ("Bad Wolf/The Parting of the Ways"), where he, Rose and Jack found themselves facing a new Dalek army that had been assembled by the Dalek Emperor, another survivor of the Time War, abducting humans by using seemingly fatal game shows - the shows apparently culminated in peoples’ deaths when in reality they were transmatted over to the Dalek ships and used to provide genetic samples to create new Daleks -, the controller of Satellite Five having defied her masters long enough to bring in The Doctor to stop them as the only man they had ever feared. While Rose and the TARDIS were sent to her home time, Jack organised the humans remaining on Satellite Five into a defence against the Daleks while The Doctor began construction of a delta wave emitter, a device that would fry the brain of every Dalek in the blast radius... and, unfortunately, every human on Earth as well, since The Doctor wouldn't have time to refine the blast in the hour or so before the Daleks arrived. As all the humans on Satellite Five fell in a desperate attempt to buy time for The Doctor, he completed construction of the delta wave emitter just as Dalek forces arrived in the control room with him... but, even though Earth had already been decimated by Dalek bombs, when faced with the chance to destroy the Daleks at the cost of whatever life was left on Earth, The Doctor refused, preferring to be a coward rather than commit genocide to vanquish the Daleks for a second time. Gleefully, the Emperor ordered The Doctor exterminated, but, at the last minute, Rose arrived, imbued with all the power of the Time Vortex, and using it to turn the entire Dalek fleet into dust. However, the vortex energy was so powerful that it would have killed her, so The Doctor was forced to take the energy into himself... along with all the damage Rose had already sustained. As Rose recovered in the TARDIS, having apparently forgotten everything about her brief reign as a god, The Doctor revealed that the energy of the Time Vortex was destroying every cell in his body, and he would soon regenerate, meaning that he wouldn't see her again 'with this daft old face'. Rose begged him not to talk like that, but The Doctor kept on talking, telling her 'Before I go, I just want to tell you, you were fantastic. Absolutely fantastic. And you know something? So was I'. 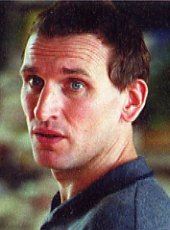 Christopher Eccleston was born in Salford, Lancashire on the 16th February 1964. He was trained at the Central School of Speech and Drama. His earliest television roles were in one off episodes of Blood Rights and Casualty both in 1990 followed by Inspector Morse in 1991. He first though came to public attention as Derek Bentley in Let Him Have It (1991). However, it was a regular role of DCI David Bilborough in 6 episodes of Cracker (1993-1994) that made him a recognisable figure in the UK. He appeared in the low-budget 1994 thriller Shallow Grave and in the same year won the part of Nicky Hutchinson in the epic BBC 1996 drama serial Our Friends in the North. As well as television he has been in numerous films including the role of Jude Fawley in Jude (1996) and Major Henry West in 28 Days Later (2002). He has also starred as a leading man alongside a number of major actresses, such as Renée Zellweger in A Price Above Rubies (1998), Cate Blanchett in Elizabeth (1998), and Cameron Diaz and Jordana Brewster in The Invisible Circus (1999), and Nicole Kidman in The Others (2001). He also played the part of villains in: The Seeker: The Dark is Rising (2007) and G.I. Joe: The Rise of Cobra (2009). In addition to his successful film career, he has continued to appear in many challenging and thought-provoking British television dramas. 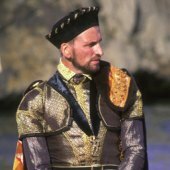 These include Hillsborough (1996), Clocking Off (2000), Flesh and Blood (2002), the Iago character in a modern adaptation of Shakespeare's Othello, and the religious epic The Second Coming (2003), playing Steve Baxter, the son of God. He also appeared in The League of Gentlemen (2002) and The Second Coming (2003). Then he was announced by the BBC as the next actor to play Doctor Who when the show commenced in 2005. He became the first actor to play the part of The Doctor to be born after the show first commenced in November 1963. His role as the Ninth Doctor however, was to be short lived when it was revealed, shortly after the new season started that he was only going to do the 13 episodes. Christopher Eccleston has twice been nominated in the Best Actor category at the BAFTA Television Awards, the UK's premiere TV awards ceremony. Although he didn't win these awards, he did, however, triumph in the Best Actor categories at the 1997 Broadcasting Press Guild Awards and the Royal Television Society Awards, winning for Our Friends in the North. He won the RTS Best Actor award for a second time in 2003, this time for his performance in Flesh and Blood. And then in 2005 he received the Most Popular Actor award in the National Television Awards for Doctor Who. Since leaving Doctor Who he has been in Perfect Parents (2006), in five episodes of the American Sci-Fi series Heroes (2007). He also played the part of Dr. Jekyll in New Orleans, Mon Amour (2008) and in seven episodes of The Shadow Line (2011). He also appeared as a narrator in the Celebrity Pig theatre version of the Shakespeare play Romeo and Juliet as part of his work for Mencap. He has also narrated bedtime stories for young children on the BBC children’s digital channel Cbeebies. As with all Doctors, the Ninth Doctor found himself pitted against that most evil of beings, the Dalek, after only a few short adventures; even being totally decimated in a war that annihilated all Time Lords but The Doctor wasn't enough to remove the Daleks from Time forever. He also met his third incarnation's old foes, the Autons and the Nestene Consciousness, as well as new alien adversaries such as the Slitheen, the Jagrafess (A massive slug-like being that controlled all news in the Fourth Human Empire), the Quervils (Porcupine-like aliens) and the Reapers (Pan-dimensional beings who attacked reality around changes in history). New individual villains were also faced, the most notable of these being Cassandra, the last human in the universe, who had undergone so much plastic surgery that she was now just a translucent sheet of skin with eyes and a mouth (Who subsequently faced the Tenth Doctor). Another prominent example was Chantal ("Only Human"), a scientist from some time after the year 436 000, who was attempting to replace all of humanity with her genetic creations the Hy-Bractors back in the Stone Age. 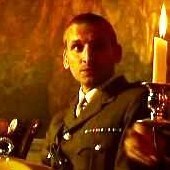 Possibly the Ninth Doctor's most memorable moment occurred in "Dalek", when he faced what may have been the last Dalek in the universe in an underground base in Utah, in the year 2012. Upon first discovering the Dalek, The Doctor was terrified, but when he realised that its weapon was damaged and it couldn't hurt him, he began to actively taunt it; even in "Death to the Daleks", in a similar situation, the Third Doctor never went as far as his ninth self did here. The Doctor even lunged at it, scaring the Dalek and making it back away in its chains, crying out 'Keep back!' like a child frightened by an abusive parent - possibly the first time viewers have ever sympathised with a Dalek more than with The Doctor. The Doctor not only attempted to torture the Dalek with electric shocks, but then ordered it to kill itself as it began to advance through the complex, finally cornering it just at the exit. However, as he faced his old adversary, determined to destroy it, his companion Rose pointed out that all it wanted was the sunlight, and The Doctor realised the truth; the Dalek was changing, due to its time with Rose... and, if he continued what he was doing, he too would change, into something terrible. Putting the gun down, he and Rose watched as the Dalek killed itself, no longer a pure Dalek, but unable to live as a human.